Ready for adventure? Ready for fun? The excitement begins as you slip into your own inflatable kayak “ducky” and start working the river. Kayaks are an amazing adventure for any size family or group. Have the day off or traveling on vacation? Come see us for one of our amazing Colorado kayaking trips. Our duckies are open and easily maneuverable and they offer a totally different experience on the river than rafting! Paddling your own watercraft is a great confidence booster for kids and an invigorating free-feeling for adults. Sitting low on the Arkansas River gives you a new vantage point and makes even small waves into events; it’s a great adventure even when the water is low! 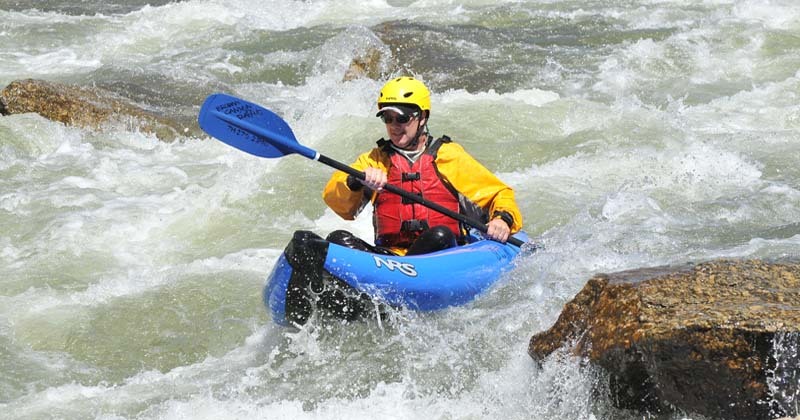 Whether you are out to have a great time with family, hanging with friends, adventuring on your own, or building a team kayaking at Browns Canyon Rafting is a totally customizable experience. Paddle to happiness under the instruction of one of our experienced and certified guides. Our guides will show you the ropes and teach you proper kayaking techniques as you learn how to steer yourself through fun rapids or challenge skills you’ve already acquired. We cater to the first timer and the experienced kayaker alike. Your certified guide will take you to the section of the river perfect for your experience level where you can build your skills, have fun and challenge yourself. Our full day inflatable kayak trips meet at our Buena Vista location at 9am. You will have a fun and exciting day on the river pausing midday to enjoy a delicious riverside lunch prepared by your guide. We choose river sections based on the group’s ability levels and wishes.